A wonderful Bluebird Video featuring nestlings, dutiful parents, and first flight of the whole brood! Thanks to these kind folks for sharing their nest cam on You Tube! 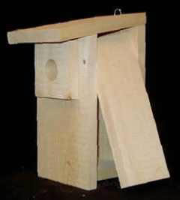 Wooden Birdhouse kits are available in feeders and bat houses too, and make for excellent projects with kids of al l ages. Be it church groups, scouts, or even school science curriculum, there’s no better way to teach kids about nature, wildlife, and the world around them. Thanks to The Cornell Lab of Orinithology’s “NestWatch” and affiliated citizen-science projects, teachers are provided with the tools they need to set up nest box trails at schools, through the “Home Tweet Home” partnership with Nature and PBS. Some schools are even monitoring nests as part of a new NSF-funded initiative called “Communicating Climate Change”, aimed at community projects that seek out local indicators of climate change. In Ithaca, NY, Dewitt Middle School students monitor nests in wooden birdhouse kits, and record data such as first egg date, a critical piece of information used by researchers to understand how birds are responding to climate change. Wood Birdhouse Kits: For Fun, For Birds, For Conservation! Looking for an interesting project with kids? For church groups, scout groups, or school activities, there’s no better way for children to learn about nature and conservation. Bird Feeder and Wood Birdhouse kits can teach kids to actually experience nature, conservation, the great outdoors. Projects like this also allow children to take an active role in improving their environment. The Cornell Lab of Orinithology’s Nest Watch Program and other Citizen-Science groups provides teachers with the tools necessary to set up Nest Box Trails at schools, through the “Home Tweet Home” partnership with nature and PBS. Please visit Nestwatch.org for more information. Great Project Overview for Virtually any Organized Kids’ Group: Doing good in your community! Birds For Brains is such a rewarding program for kids, seniors and coordinators alike (the birds too!). If done right it will not take much funding at all to start and run. – First Off and Most Importantly the Volunteers– BFB is set up specifically to get kids of any age involved. Daycares, scout groups, 4H, classrooms or any group with kids at any age (or if you just have one child that you would like to get accustomed to doing good for the community.) At least one adult to plan and implement the program is needed or a group of adults such as an Audubon Chapter to oversee the children. – The Site- The easiest step is to find a place to visit and set up the bird feeders. Nursing or Assisted Living Homes, a retirement home or a single family home with a senior or disabled individual are in every neighborhood and will welcome the program and the enrichment that comes with it. – Bird Feeders- Many ways to keep the costs down, BFB was initially set up to recycle wood from discarded fence panels or scrap that can be found around town. This idea was thought of not only to recycle and help the environment but also to have another hands on activity for the youth. Any fencing or construction company can direct you to scrap wood that could be used and Google is great to find Do-it-yourself plans to build the feeders. We have not yet built any feeders for the program because once word got out about the program donations of feeders were given. We immediatley received a couple from the local Audubon Society Chapter and then as we approached Critters Feed and Seed to fill the feeders they to donated many feeders, not to mention the Birdhouse Chick donating 2 large rainbow finch feeders. – Seed- If you live in a larger community you have a feed store in the area that you can approach. This is great on so many areas, you are starting a relationship with a local company and shopping local (rather than the big box stores), the seed will be of the best quality, and the relationship you start will help the local seed store by spreading the word that they have helped a good cause out and hopefully will attract new business. Critters Feed and Seed in Moorhead, MN has been a wonderful partner and I cannot thank them enough!! When possible they get ‘sweepings’ from their seed supplier that would otherwise go to waste. This causes some additional work for the supplier and the vendor but when they hear that the seed is going to the Birds For Brains program they will be happy to offer the help. I have to mention that at times ‘sweepings’ are not available and Critters has been more than kind to donate seed off the shelf! If you do not have a seed store contact a grain elevator, local pet store or any location that offers bird seed. Make sure you explain where the seed is going and the Mission of BFB. – Visiting the Site- We ask that you stop by once a week or at the very least every other week to fill the feeders, clean the bird baths and spend some time visiting and interacting with the residents. Make sure that the activities coordinator knows when you will be there. Get involved and play games do activities or just visit. 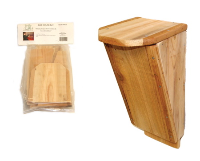 Bird Feeder and Birdhouse Kits are also an inexpensive option for starting a site in your area. For more information, please visit 3littlebirdsonline.com website. Portland, OR —Today, Oregon Health & Science University (OHSU) has announced the birth of twin monkeys named Mito and Tracker, the subjects of Dr. Shoukhrat Mitalipov’s spindle transfer experiment. Based on the limited information available on Mitalipov’s recent Nature article, In Defense of Animals (IDA) is unable to comment immediately on the details of this particular research. However, based on OHSU’s history, this announcement is likely to be just the latest in a long line of non-human primate results heralded as “breakthroughs” by OHSU, only to be forgotten when they fail to produce the cures and treatments they promise. In the scientific community, the word “breakthrough” has special meaning. OHSU has rendered it practically meaningless by using it time and again to describe its non-human primate experiments – including in its latest press release. True medical breakthroughs are all-too-rare – the stuff of Nobel, Lasker and other prestigious awards. However, according to OHSU’s Web site, OHSU researchers average one new breakthrough, innovation or therapy either once every three days, or once every four days. OHSU’s latest press release comes at a time when the Oregon National Primate Research Center is asking for a $14.8 million construction grant from the National Institutes of Health to expand its facilities. This grant is in addition to the $12.7 million it received in 2008 as part of its NIH base grant to support the Primate Center – the 49th year of such taxpayer support. OHSU received a total of $169.9 million from the NIH in 2008. While OHSU is swimming in taxpayer-funded NIH money, non-animal methods of research remain underfunded, yet have advanced science immeasurably. Just last week, IDA submitted a 26-page, 153-citation report to NIH peer review councils that examines the costs and benefits of animal experiments. In this report, which is available upon request, IDA summarizes critiques of animal research from the peer-reviewed literature and highlights a few cutting-edge scientific techniques that are in danger of being lost. As OHSU continues to demonstrate, outdated “animal models” are being perpetuated at the expense of 21st-century science and true research breakthroughs. In Defense of Animals is an international animal protection organization located in San Rafael, Calif. dedicated to protecting animals’ rights, welfare, and habitat through education, outreach, and our hands-on rescue facilities in Mumbai, India, Cameroon, Africa, and rural Mississippi.. Recently I came across this article and thought it was a brilliant idea for a 4th grade class elementary school project. Worthy of posting to let as many as possible know about it, 70 bluebird houses were added to a community! This project taught many lessons, including bluebird conservation. Forty-nine students built 70 bluebird houses to hang throughout the neighborhood. The wood was provided by the EPA and was cut by a wonderful volunteer. We then had a great day doing a multitude of math activities based on the geometry of the pieces and then assembled them in the classroom with a variety of electric screwdrivers and hammers. Each kid went home with one blue bird house to put in their own yard and we put up the extras around the school and the surrounding community. We had a blast! 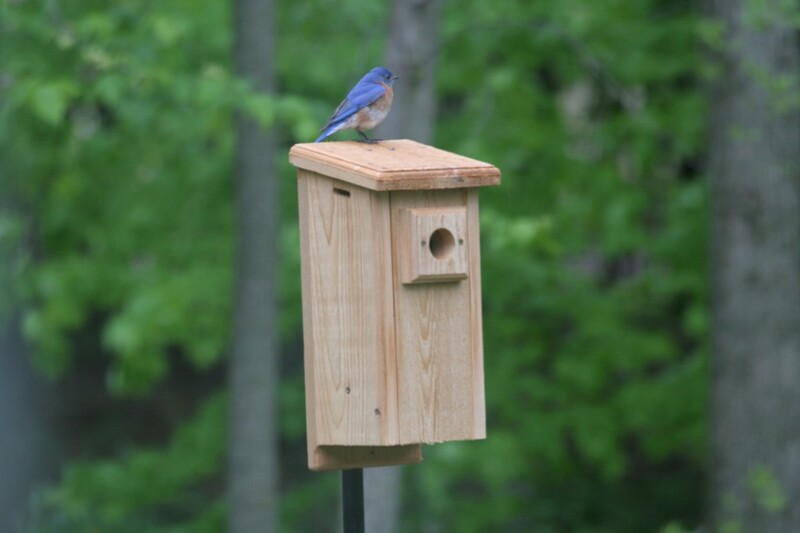 Blue Bird Houses: Basic Nest Box to Castle! Nest Box basics to recycled houses, to deluxe architectural models, Blue Bird Houses come in many shapes and sizes! Provide bluebirds with their required nest sites and help this iconic species continue to thrive. Competition for these nesting cavities is still fierce, and by putting up blue bird houses, you can encourage them to nest in your yard. The best houses are not the most expensive, but the ones which are approved by The North American Bluebird Society. They have proper dimensions and drainage, and usually have some type of predator guard around the entrance. Simple nest boxes, can be acquired for as little as $15 to $20. While the more fancy and decorative models range anywhere from $50 to $400 depending on materials used and level of detail. This patina copper top bluebird house is actually hand crafted of PVC, the same vinyl siding on your house! These types of houses will never crack, split or fade, and generally last a lifetime. Nesting material and bird baths will also encourage bluebirds to take up residence, as well as their favorite food: meal worms! Thanks to this Nest Cam, see a female Bluebird make final tweaks to her nest inside this bluebird house! A non-profit organization dedicated to Eastern bluebird conservation. Once abundant throughout the US, the North American Bluebird experienced a severe decline in population mostly due to competition for nest sites by non-native species, loss of habitat and pesticide use. The House Sparrow and Starling are both fierce competitors for available nest sites, and are known to be very aggressive towards Bluebirds. Thanks to efforts by Bluebird Societies and many people who have constructed bluebird trails with nest boxes, their numbers continue to increase. Encourage bluebirds to nest in your yard by providing bluebird houses. North American Bluebird Society (NABS) approved houses are best, to ensure successful broods. Bluebirds prefer open, grassy areas where they can perch and easily hunt their main diet…insects. Beneficial to your environment, they eat insects considered to be damaging to gardens, like cutworms. 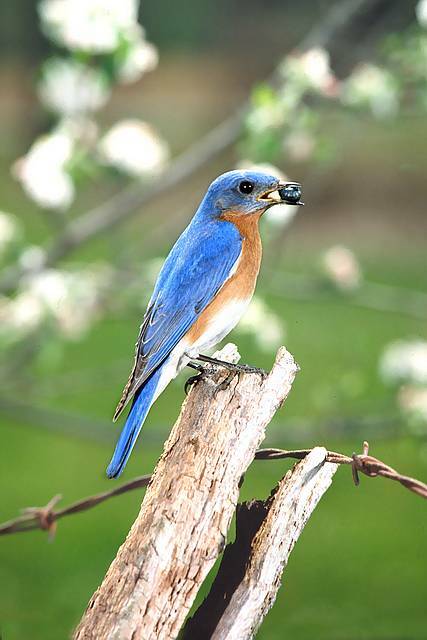 Providing Bluebird Feeders with meal worms will also help attract them to your yard. For some reason…no other bird will enter a bluebird feeder! Our 2 successful broods this season were attributed to feeding meal worms daily and providing several fresh water sources…the babies are adorable, we hope to see them next year too! Hummingbirds provide great entertainment, their sheer size and antics around feeders are fascinating to watch. Did you know they are excellent pollinators too? Yes, they’ll spread the love amongst your flower garden! In the next month or so, hummingbirds will begin their long migration back to winter grounds in Central and South America, so nesting season is coming to a close for this year. But…next year you can attract more of the tiny jewels at your window hummingbird feeder by adding nesting material made especially for hummingbirds. It’s called Hummer Helper, and has been endorsed by The Hummingbird Society. 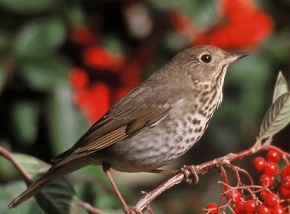 “It encourages nesting in a natural way” and may likely bring more fledglings to your feeders. Hummingbirds also practice site fidelity, meaning they will return to the same spot every year if it benefits them.